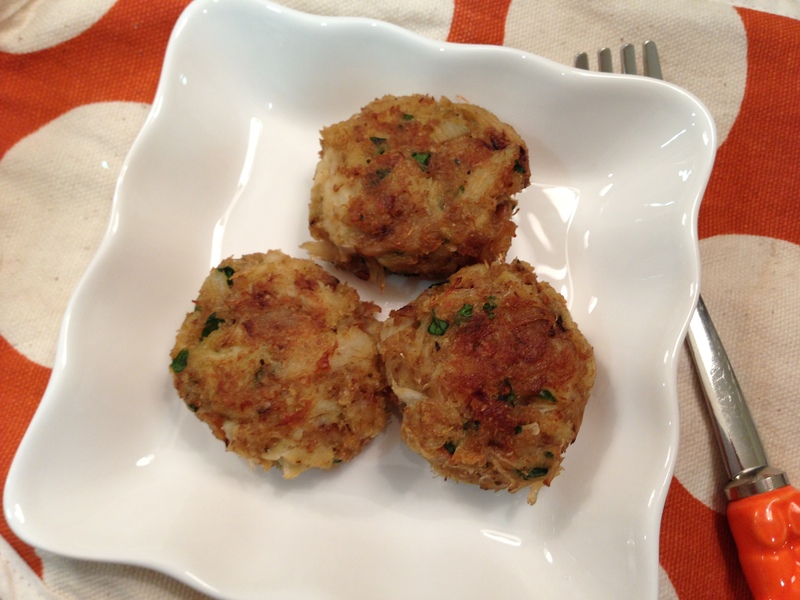 crab cake | what is clara eating today? this recipes is slightly modified from Martha Stewart’s Hors D’oeuvres Handbook. I love the recipe. sounds complicated seeing all the ingredients, but it is super simple. all you have to do is mix all the ingredients, make round cakes, pan fry lightly and bake. Mix the crab meat and the bread crumbs. Set aside. Mix rest of the ingredients well. Add to crab meat and stir. season with pepper to taste. shape about 1.5T of the mixture into round disks, to make 12. Heat 1T of Canola oil in a skillet and place 6 of the rounds and cook until golden brown on the bottom, about 1 minute, Turn the crab cakes and cook until golden brown. Transfer the crab cakes to parchment paper lined baking sheet. Repeat for the remaining 6 crab cakes. All the oil in the skillet should be absorbed by the cakes. Preheat the oven to 400F. Bake the crab cakes for 10 minutes.